Beautiful waterfront custom home located on the point of the Harbour Island peninsula with outstanding deep water, sound & marsh views. This property is as close to owning your own private island as possible. A private dock & 13,000 lb. boat lift located on a very well protected deep-water creek offer easy access to the Atlantic Ocean and BeaufortGÇÖs creeks and rivers. The home design is positioned to capture magnificent views from every vantage point. You will literally feel like you are on a ship cruising the waters of the Harbor River & St. Helena Sound. A private 3 -+ mile long sandy beach is just around the corner. A must see property. 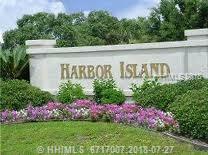 First floor , Single bedroom marsh and ocean view condo on Harbor Island with loads of potential. Short walk to the sugar sand beaches. From this lot is a short stroll to the beach via the boardwalk and a short walk or golf cart ride to the Beach Club. Water views offer a natural and pristine oasis. Amenities on the island include a large pool, tennis courts, fitness room, clubhouse and a recreational room and pool. Harbor is a pristine island full of wildlife . Cul de sac lots like this are a rare find. A private, lush tropical setting in this Lowcountry oceanfront 24/7 gated community of Harbor Island, a 1400 acre barrier island. Visit this wonderful island and discover what so many others have... that this may indeed be the paradise for your vacation home or full-time resort residence! This is the most affordable home site available on Harbor Island, located a short drive from Historic Beaufort, SC and Hunting Island State Park. Located on a quiet section of the island a short golf cart drive to the clubhouse, tennis courts, pools and private three mile long beach. Build your new dream home.